Due to all the shoaling on the ICW, I thought it was time for a massive update to "GPX Routes", one of the choices at left in this blog. 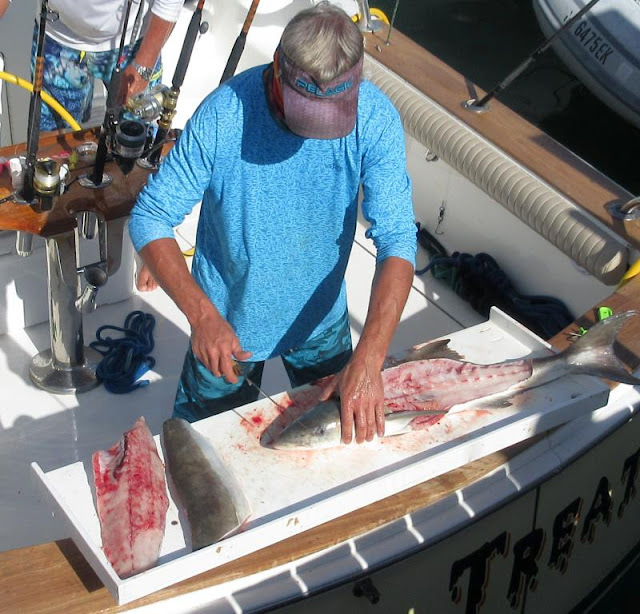 Shoaling has been massive over the winter months with Shallotte Inlet being especially hard hit. The path through is so narrow that there's really no leeway for drifting. 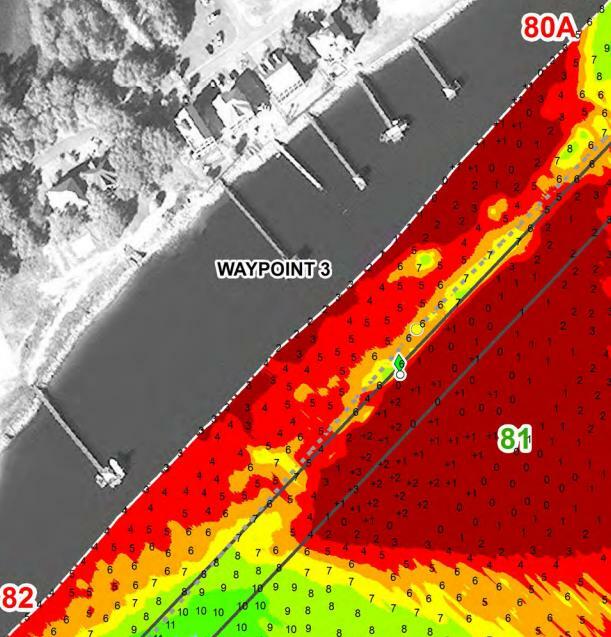 The US Army Corps of Engineers (USACE) has been busy surveying the trouble spots and has helpfully supplied waypoints for the deepest water through the shallow areas. I took those waypoints and formed a route for Shallotte, Lockwoods Folly, and Browns Inlet. The updated GPX files are now posted in "GPX Routes" at left ready for downloading. I also updated the instructions on how to get the GPX files with the routes into a navigation program. The easiest way remains a direct download into an iPad navigation app. You must use Safari on the iPad for everything to work but once you open my blog with Safari and go over to GPX Routes, just tap on a route and you will have a choice of apps to use. You select one of the choices and then the new route is automatically loaded into your app, easy. 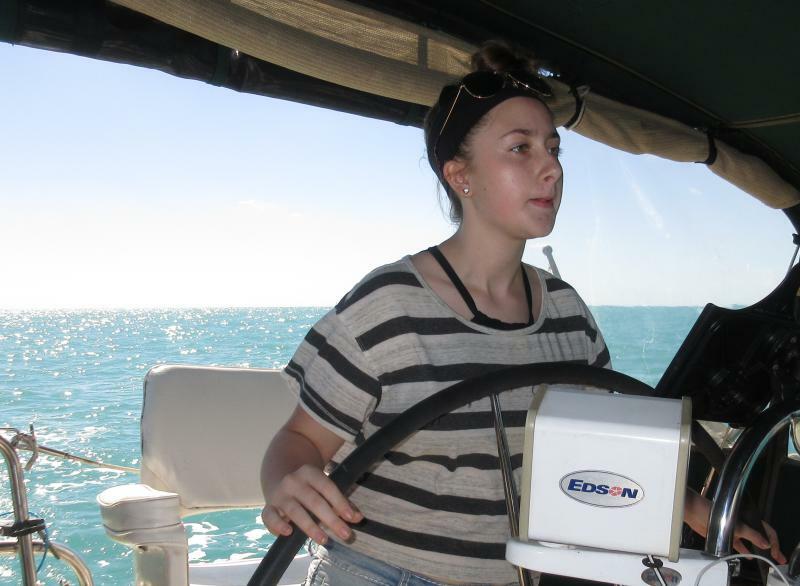 Once loaded, now you can steer your boat to follow the route for the best water per the USACE. The route is especially useful for Shallotte where the channel is less than 40 ft wide and the depth is down to 4 MLW. If you miss the channel, you are aground! The downloaded route helps a lot. Other than working on that, we took another run to the grocery store. With the town busses, we're able to leave at 11:00 and be back on the boat by 12:20 at a cost of $2.00 for the round trip for the both of us. It's sure cheaper than renting a car and you don't have to worry about parking. I plan on more updates Thursday on other items at the left to bring it all up to date with the latest changes in software and apps, stay tuned. The wind had calmed down some more and Ann can now paint in the cockpit without fear of a gust toppling things over. She's been away from pastels for awhile and she's getting back in the swing of it. I thought she did rather well with today's subject. Ann's looking forward to a month of uninterrupted painting in the cockpit. 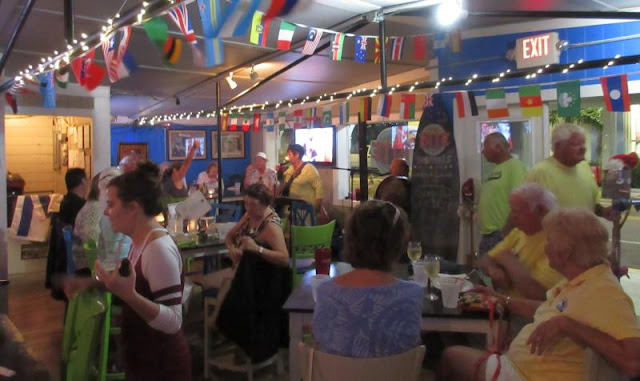 We walked over to Key West Bite where they feature Fiona every Tuesday night starting at 7:30. 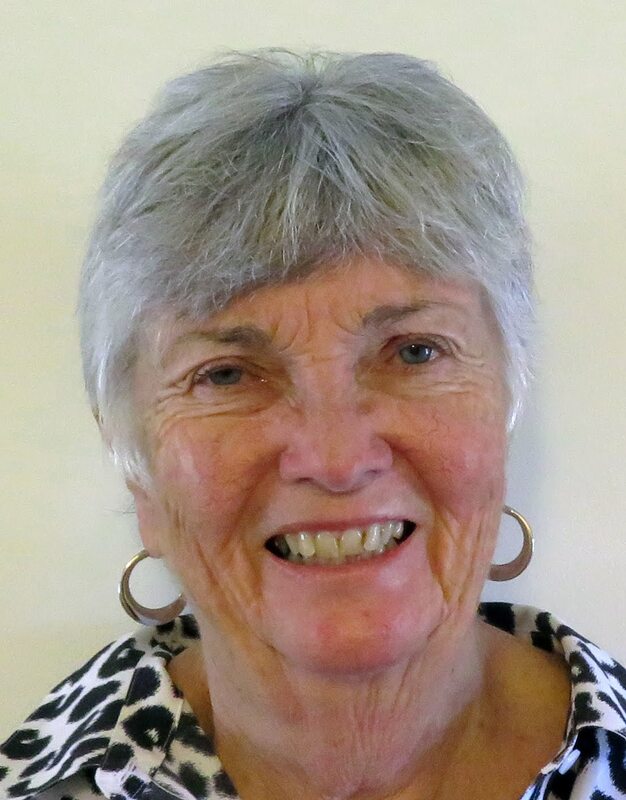 She is Irish but she sings a wide assortment of songs. We just enjoy relaxing and listening. She is usually accompanied by two gentlemen who bring "Ugly Sticks" with them. They pound on the sticks, sort of in rhythm with the music and bounce them on the floor at the same time. It's rather odd. Traditionally, they search through the audience for prey to inflict the playing of the stick (by the prey). Tonight, Ann got caught and did her part for one song. It sure made a racket. We stayed for about an hour and walked back. It's nice for Fiona to be so close and not have to hop a bus for the entertainment. Ann's going to dedicate this week to resuming her painting. If we were at home, we would be holed up inside, nice to have such warm weather. It looks like we are in for some exciting times on our trip north in the spring. Lockwoods Folly and Shallotte are both shoaling in with Shallotte as low as 4 ft at low tide by going outside the channel. It's down to 1 ft in the channel at low tide. Last year at this time there was news of dredging but I haven't heard anything yet about these two areas. Aqua Map app will load and display them flawlessly. They only charge $15 for a chart of the entire US with updates forever, a bargain. The download is free, the US chart is $15. 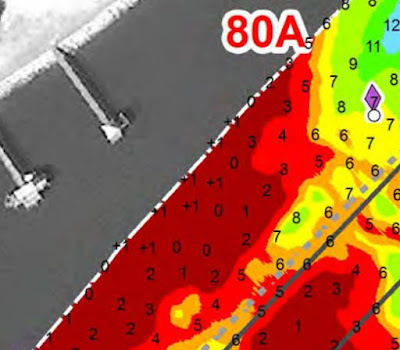 Of course, one could always go outside and bypass the shallow spots but where is the fun in that! Still, there is a best route through as recommended by the Army Corps of Engineers (ACOE) who does the depth surveys. I entered the waypoints and made a GPX file that will be on this blog site sometime tomorrow. The GPX route will give you the best chance of getting through but even that route is only good for 4 MLW at the low points by Shallotte Inlet. The GPX routes will download and display directly on Aqua Map. Dinner tonight! At least for next door. The weather continues to calm down and several fishing boats have taken up residence nearby. The one next to us caught dinner and they were cleaning their catch on the back of the boat. It looked pretty good. We had homemade fish sandwiches, ala Ann - my favorite cook! We'll do more of the same Tuesday, that is, rest and relax on the back of the boat. I'll post the new GPX routes too. Every year at the end of February there is an art festival held on Whitehead Street. 2018 is the 53rd edition of the event. 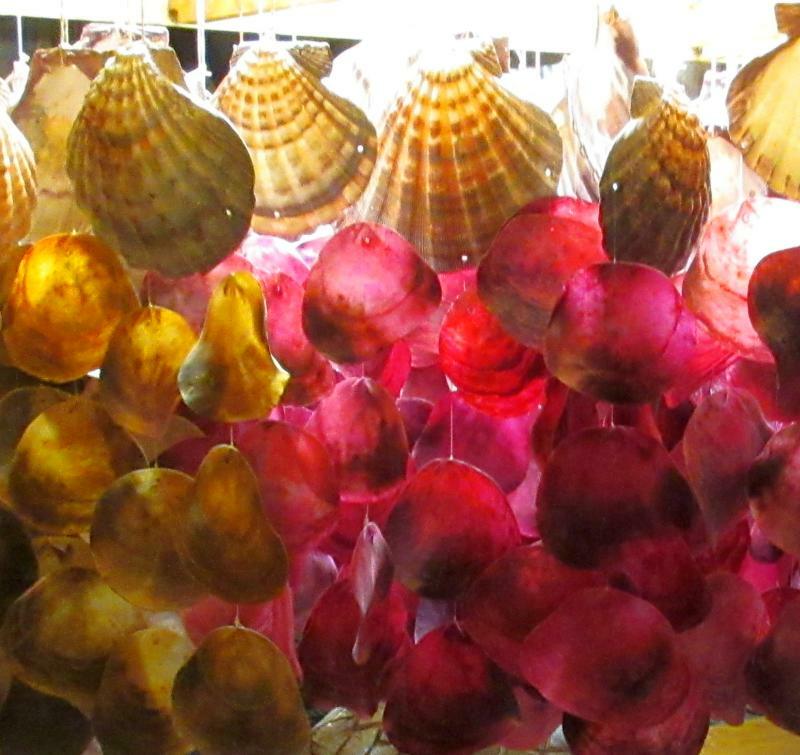 They attract exhibitors from all over the southeast and some from farther away. 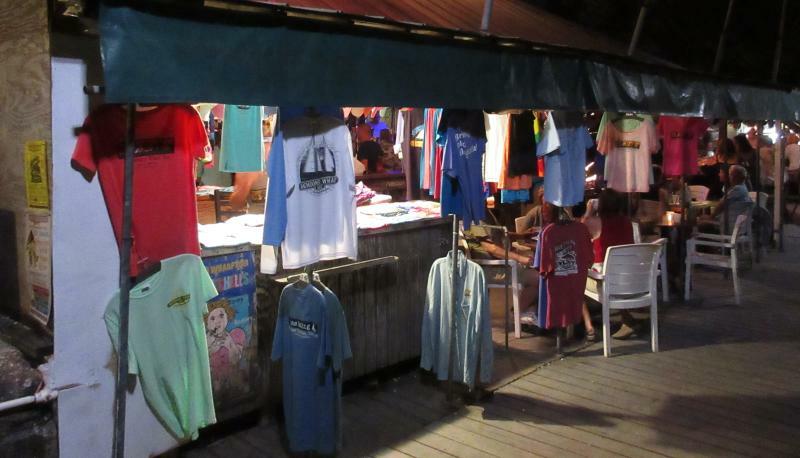 For this show, they can only exhibit and sell items they personally make. 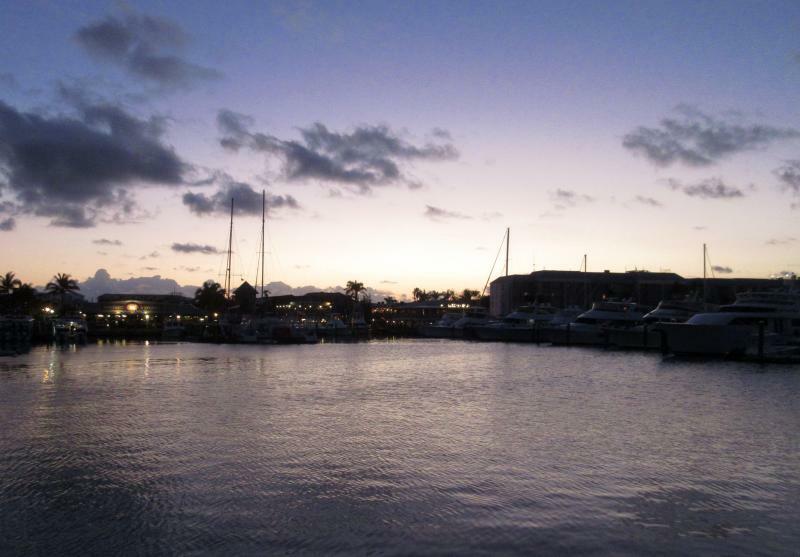 We make it a point of seeing the show and it's within walking distance of the marina along Caroline Street. 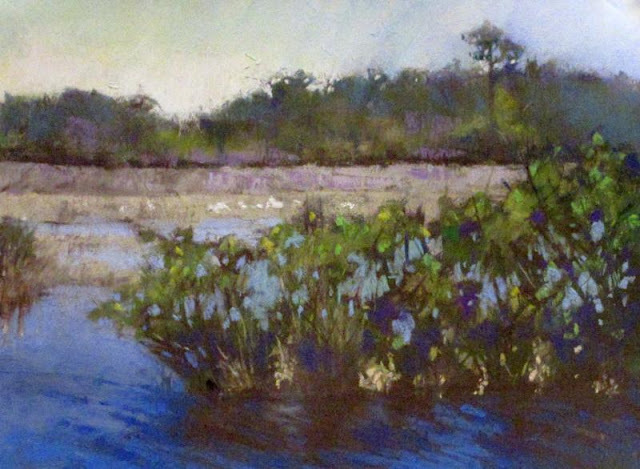 More than anything else, Ann likes to "talk shop" with the artists in trading ideas on colors used and the paper. A meeting that repeats itself throughout our stay, notice the interested dog! 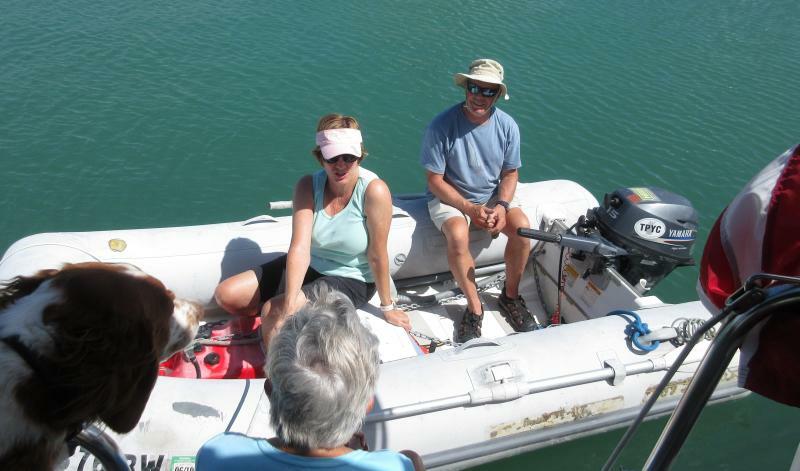 Later in the day we saw a dinghy idle up and were visited by friends we had met in Hampton, VA. It is often the case anymore, that more people know us than we know them although in this case we had met before. We were invited over for wine at 5:00, a traditional time among cruisers. The weather was absolutely perfect for sitting out on the back of their boat sipping wine and talking of things aquatic. They are in route to completing their first "loop" after going north through Chicago and down the waterways to Alabama and now Key West. They will leave and go up the ICW to return to Hampton, VA. Meanwhile, we simulate a ping-pong ball going back and forth between Poughkeepsie, NY, and Key West every year. I wouldn't give that up for anything. I mean, everyday it's 78 or 79 for a high and 70 for a low, how can that be better? And, we can listen to whatever music we like, live, or not and just do our own thing, it's fun. 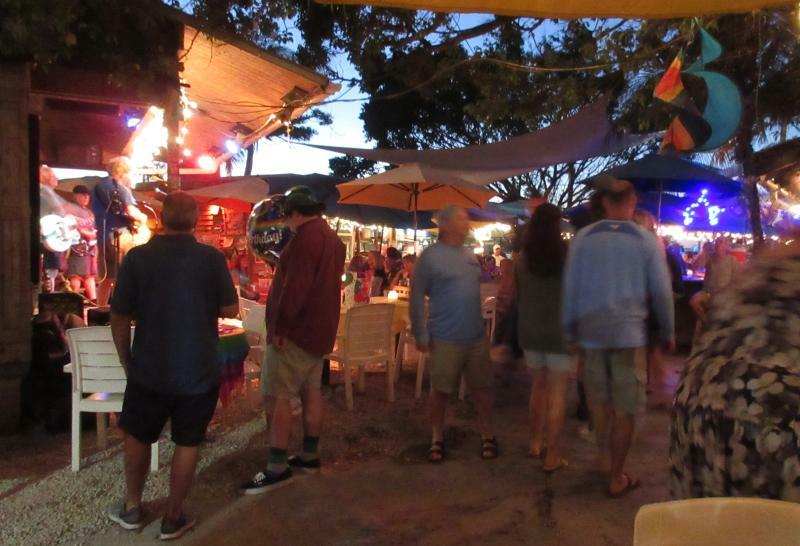 The traffic on US 1 was horrendous, apparently due to the largest flea market in the Keys taking place north of here. As a result, Ed was about 1.5 hours late but he did find us in the end. As usual, the parking lot was jammed packed, no spaces available so I led him to the parking garage where we still had a ticket from when the kids were here that was still good. He had to go to the top floor of the parking garage to find a spot. I'm sure that during spring break even that option won't work. As some of you know, I am now the Waterway Guide ICW Editor so Ed and I had a lot of stuff to go over. Nothing will change as far as my blog, my yearly guide, or posts on Active Captain are concerned, they both will continue unabated. I will be keeping the Alerts on Waterway Explorer up to date for the cruising community and also be adding some of the anchorages I use along my route to Key West. 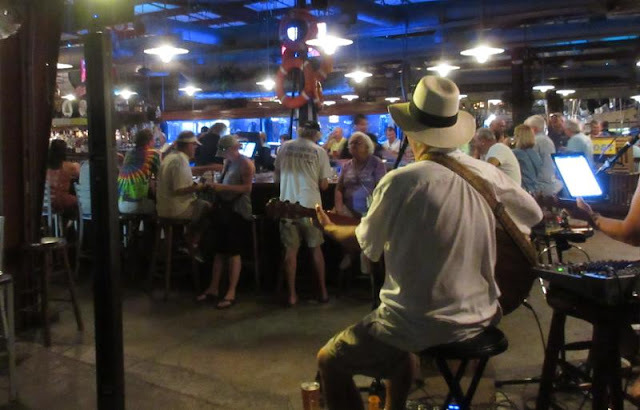 We were treated to fish sandwiches at Schooner Wharf where the Paul Cotton band was playing. 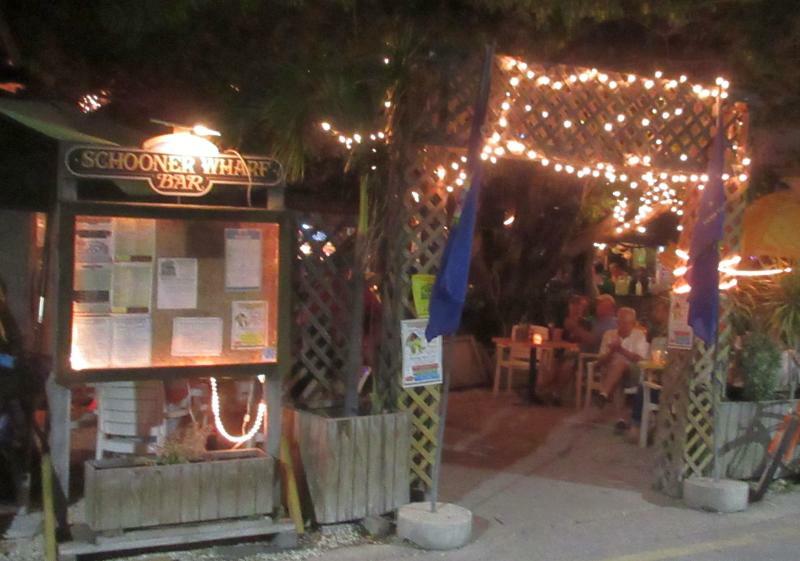 We enjoy Schooner Wharf's fish sandwiches as well as anyone's, they were good. Ed has a long drive back to Marathon in the dark. He has a meeting there on Sunday. We're ready to turn in for now. Ann was in need of new sandals so we went to the one place with the biggest selection, The Sandal Factory on Duval Street. She tried on a bunch and found what she wanted but they didn't have her size in stock. We were about to give up on that but the salesclerk offered to ship it from their Marathon store who did have it in stock. Yes, right... So with nothing to lose, I gave them one of my boat cards and sure enough, we got a call about a week later and they had it waiting for us. The store was in the 400 block of Duval Street so we just walked down to pick them up. 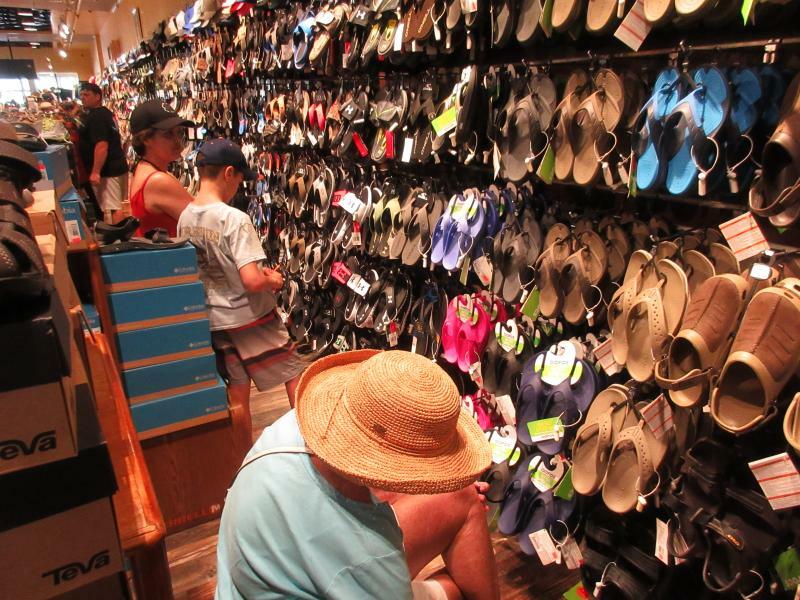 This store is huge and has the biggest selection of sandals I've ever seen. Ann tried on the pair from Marathon and they fit perfectly, mission accomplished. On the way back, we took our customary detours through the back streets to see the trees in bloom and sure enough, there were several. 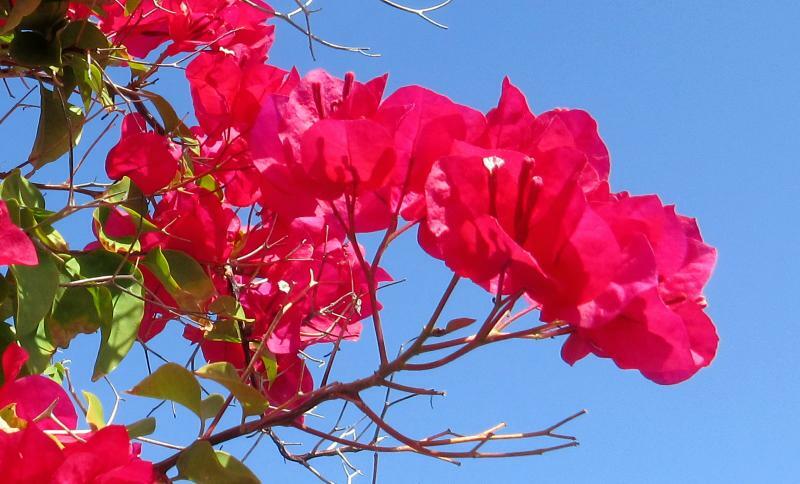 We are not accomplished enough to know what they are other than they sure look pretty. The entire boardwalk will eventually be all ipe covered. Here's the underlayment by the pool. On Saturday we meet up with Ed Tillett of Waterway Guide for lunch and discuss business prospects for his guide and how we may mutually benefit. It should be an interesting meeting, at least to me. 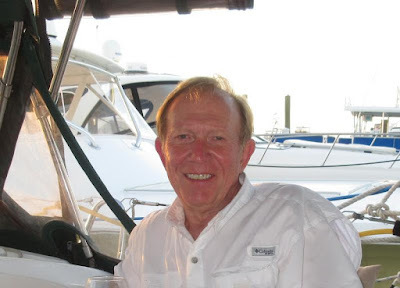 I am dedicated to continuing to input to Active Captain, my blog, and my yearly guides but I will also be a part of Waterway Guide, at least for the ICW edition. Once the wagon was set in place, the rest of the surrounding tables and roof (what there is of it) grew like topsy. Some tables are shielded from the rain and some are not so be careful where you sit if rain is expected. They are famous for their fish sandwiches and conch fritters. The procedure is to find a table somewhere and go up front to order at what is left of the food wagon. Once you order, you can return to your table and they will bring it to you. There are no walls except what has been built up over the years by memories left behind. The ceiling is lined with memorabilia from former customers and the interior walls are likewise decorated. One could just sit and take in the ambiance for several hours. You can choose to take a table "inside" or on one boarding the sidewalk where you can share conversation with those walking by. On Thursday through Saturday there is a live band that plays in a newly designated bandstand close to the wagon itself, that's new for this year. 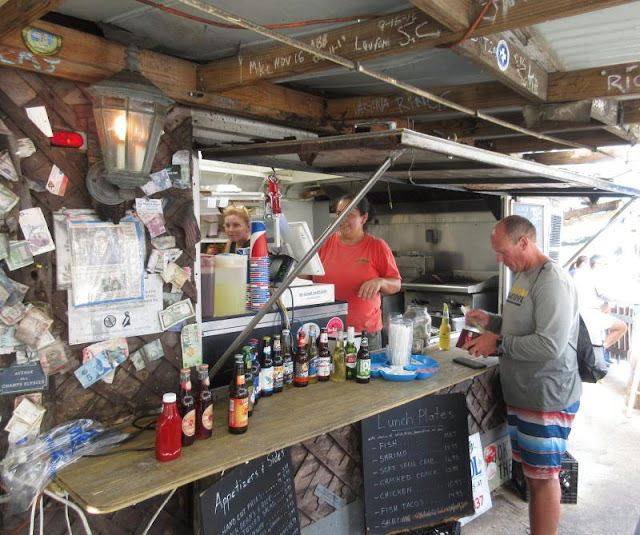 BO's Fishwagon is yet another must see place in Key West, don't miss it if you're in the area. Ann and I continue on a recovery trajectory. According to literature, we should be contagious free by late Friday and fully recovered by Saturday. While being grounded, so to speak, I've completed my evaluation of 14 iPad navigation apps and written a treatise on the subject. I expect to publish the results within the week. The evaluation was one of the biggest efforts I've ever undertaken other than my yearly guide. Hopefully, it will be of use to some people looking for a good iPad navigation app. 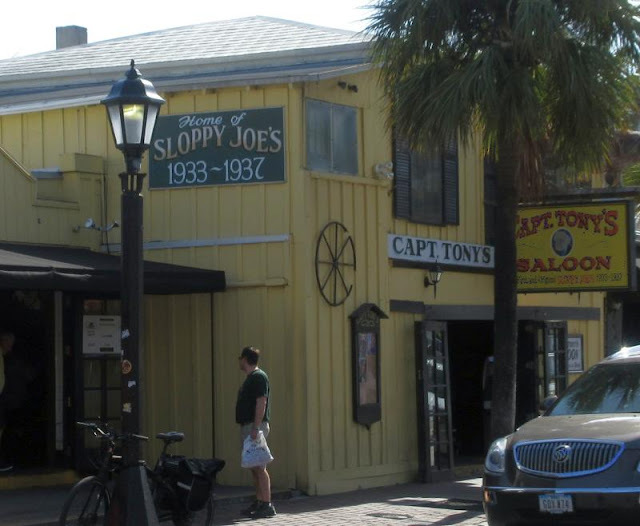 The original Sloppy Joe's restaurant and bar was in Havana, Cuba. 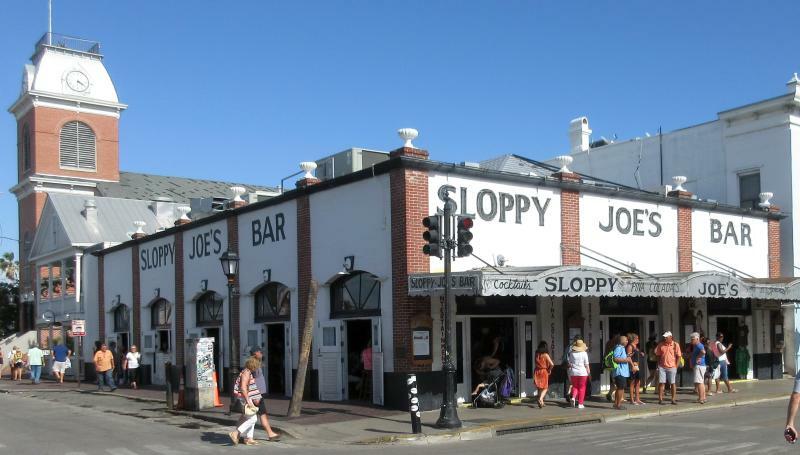 Hemingway was instrumental in getting a bar in Key West renamed to Sloppy Joe's. However, it is not the Sloppy Joe's on Duval Street. 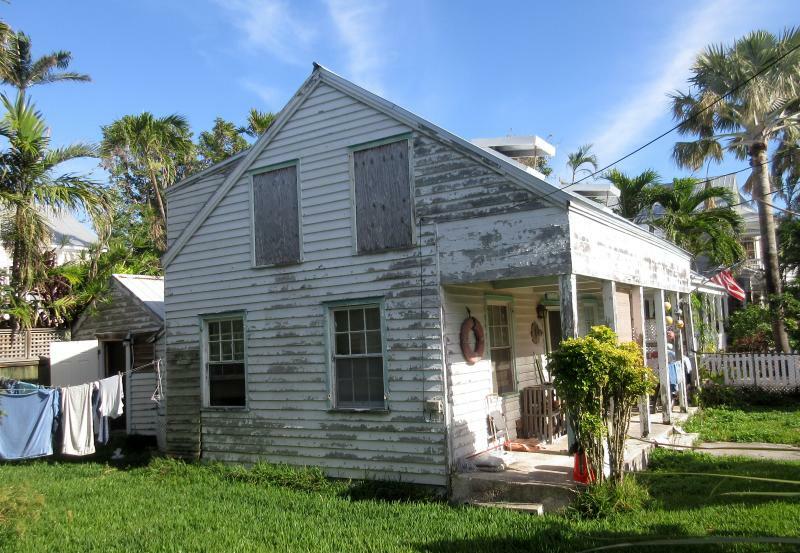 There's a bar just off Duval named Captain Tony's Saloon that was the one Hemingway frequented. The Sloppy Joe's part was moved to Duval Street after Hemingway left Key West so there's no record of him ever having visited the Duval location even though they picture him prominently in the restaurant. 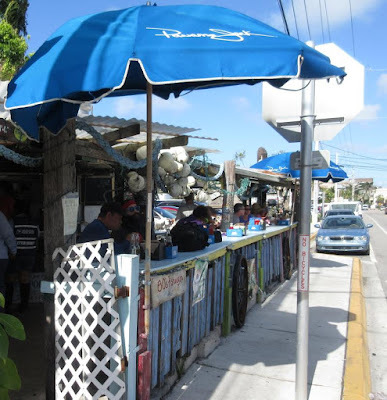 The one on Duval Street is the famous one and the one all the tourists go to and they have the famous Sloppy Joe burgers. We had one last year and listened to Barry Cuda play and the burger does have a unique taste. True to its name, we ate the Sloppy Joe with a fork. 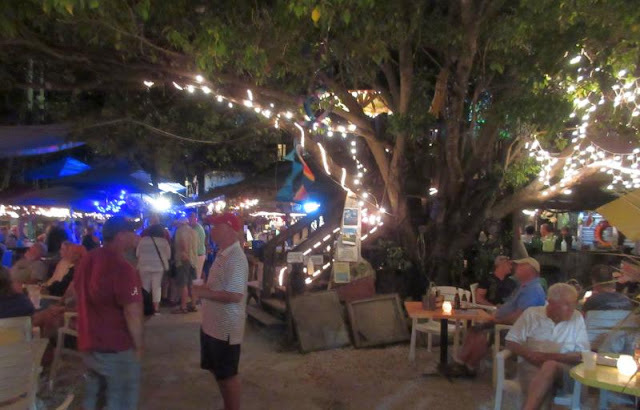 If you ever come to Key West, you ought to eat at the place once just for the experience. There is always someone playing and it's open air (no AC) but that's part of the charm. Unfortunately, if there is a tour boat in town, it's almost impossible to get a table. Ann and I are gradually recovering from our combination cold and stomach virus. It seems to last about three days so not much was done today except laundry. The boat is back to a two person layout now and we're just waiting to recover. 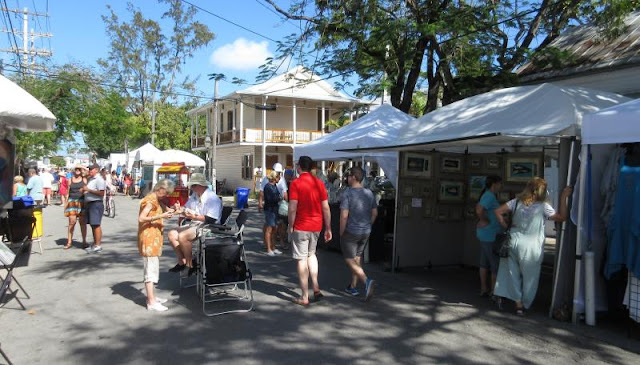 We still have over a month to go in Key West and we're looking forward to it. Sarah: This morning we had bagels and did some homework. After that we got ready and headed for the beach. The entrance to the park is real fancy and new. It was pretty windy today, but there was no rain. At the beach we went swimming and I had my leftover Cuban sandwich for lunch. The sun was nice and hot; with the breeze it felt pretty nice. After the beach I headed over to an appointment for my sunburn that looks weird. Now were just settling down and were probably going out to enjoy are last night in Key West, bye. Natalie: Today was a calm, fun day! I finished up my homework, which got a burden off my back. Then it was not rainy today so we got our swim gear together and went out to the beach. Sarah and I swam for a while then dad joined me for a climb on the rocks and mom took me to get some lunch while Sarah and Dad had the rest of the Cuban sandwich! Sadly our beach time got cut short due to a really bad sunburn on Sarah. But this did not stop dad and I taking an adventure to the southernmost point of the continental U.S.A. First we went to a little beach and walked all the way to the end of the dock to take a few pictures. It was a good thing since having no patience waiting in a long line just to take a picture in front of a big buoy! Dad and I found an ice cream place and talked with a nice lady from Massachusetts. 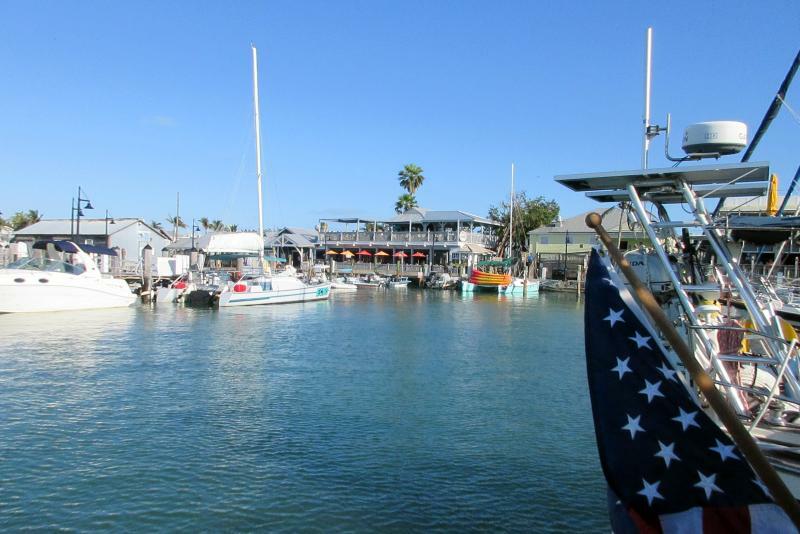 After coming back to the boat and showering, I am ready to settle down, Au revoir Key West! It was a good day for the crew but not for the captain and first mate. We both caught something and spent the day in bed. It was a big nasty so please excuse the short post. I think Ann and I will hit the hay by 9:00 at the latest. Hopefully, we’ll be better tomorrow. Intent on holding that line! Natalie: We had a fun day sailing and taking walks down the docks. Woke up to some bacon and pancakes then worked on some of my homework while Sarah, Dad, and Grandpa got ready to go out sailing. We had ham and cheese for lunch then at 1:00 we headed out on a sailing adventure! It wasn’t very fun for me because I got seasick and so did my Dad. But we came back early so I was ok! After that Grandpa and I went for a walk around Caroline St, and with Hoolie, too! Sarah and I had more ham and cheese for dinner when everyone else had chicken salad and to top it off we ate ice cream with chocolate sauce for dessert! Sarah: This morning I woke up and was ready to sail! Dad made amazing pancakes for breakfast with bacon. After that we had to do our homework for school. When I finished my homework I helped grandpa get the lines ready for our departure. Soon later we officially left, right away we put the main sail up. It was wonderful feeling the wind and hearing the waves brush against the bow of the boat. When we went past the beach we put up the jib and turned off the diesel. We didn’t see any sea life and Natalie was a little sea sick so we turned around. Our highest speed was 4.5 knots, but the on the way back it averaged at 3. 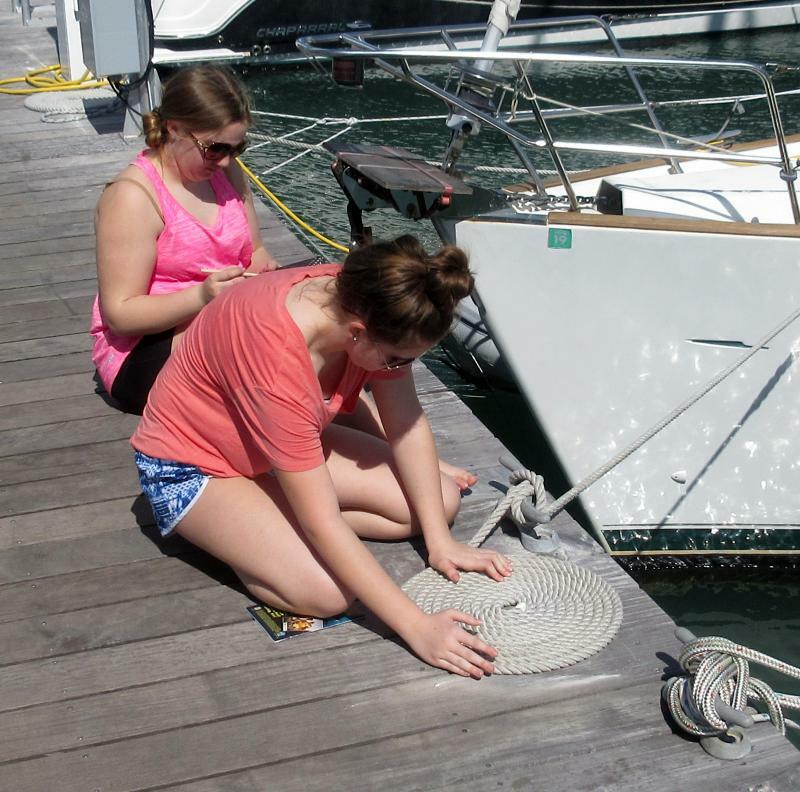 I sailed the boat mostly back and was able to put ropes on a piling. Afterwards we went to CVS and got ice, basically walking around some more. We had dinner and ice cream; we might also be watching a movie, bye. A Saturday tradition is for Philip to make pancakes with bacon so he didn't miss a beat this morning and all was well. The main event of the day was sailing in the afternoon. The winds were forecast to be 10 kts or so, not too bad for some of our less sailing experienced crew. getting off the dock was an all-hands on deck exercise. Two lines on each side had to be removed off pilings, two forward lines removed, aft lines untied, dinghy untie and retied to a side line staying with the dock, and the electrical line unplugged and tied to the boat. The stepping platform had to be removed too and the anchor raised. No big deal - but don't forget anything! More than once we've come to an unexpected stop backing out of a slip due to a forgotten line. Now everyone is tired, full of chicken sandwiches and watching Captain Ron, the favorite movie for sailing families. I think the kids have seen it a dozen times and we've seen it at least five times that I can remember. That's where we learned the "Captain Ron Maneuver" that's we've adopted when going into a face dock. We used it once at Hinckley's in Savannah when the tide was running 2 kts, the wind was blowing and there was exactly one boat length of dock space among expensive Hinckley boats. They had their crew out to catch us (about five dock hands...) and Ann was at the helm as usual and headed in at about a 45 degree angle, swung at the last moment and put it in reverse. 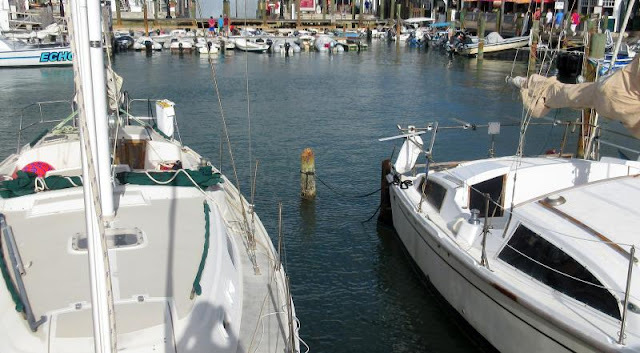 The boat lost forward momentum but continued to turn and was flush against the dock. That's when one of the dock hands shouted out, "Captain Ron Maneuver!" We both said, "Yes!" Sarah and Natalie arrived today with their parents from the frozen north. Now they have blog duties along with enjoying Key West. 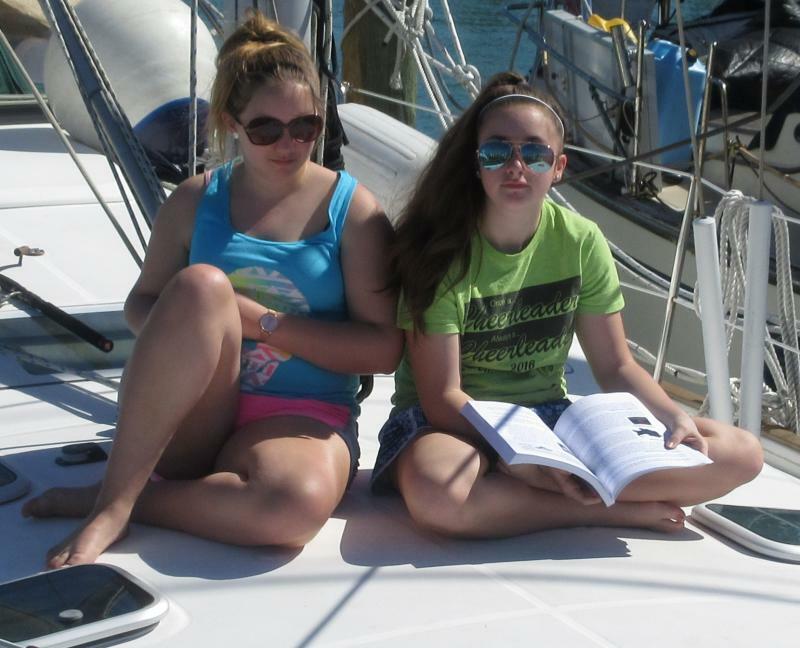 Natalie: Yesterday we got to the boat after a long day of hiccups and lots of naps! Today we took it slow but still had some fun. First people came in and took two damaged pillars out of the ground to replace them after the hurricanes. My dad and I went out to get coffee from the Cuban Coffee Queens which I must say, even though I do not like coffee the Cuban sandwiches are truly Tasty! As we continued our slow day I sat on the back of Nana and Grandpa’s boat watching the dinks trying to get by the big barge in the way! In the afternoon everybody (including Hoolie) but my dad went for a walk around the marina. After a while Nana, Grandpa, and holy went back to the boat and mom, Sarah, and I walked around to some of the stores near by. Now I must go so I can enjoy some chicken potpie by my Nana! Sarah: Today I woke up and I thought I was still in a dream! Going through exams and project after project really made Key West a relief. We had a delighted breakfast with beautiful warm weather. For the rest of the morning I read boat related books and watched construction workers taking out pilings. 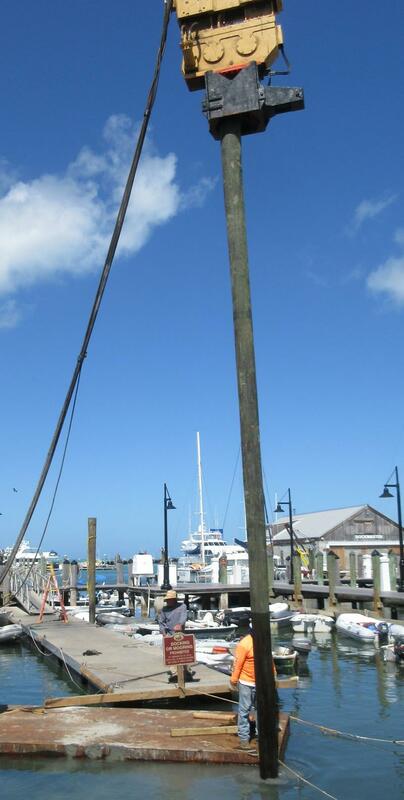 The pilings they were taking out were damaged from the storms months before. After we eventually went on a walk to see beautiful Key West. Walking through the streets and on the docks made me realize how long I have been going here. 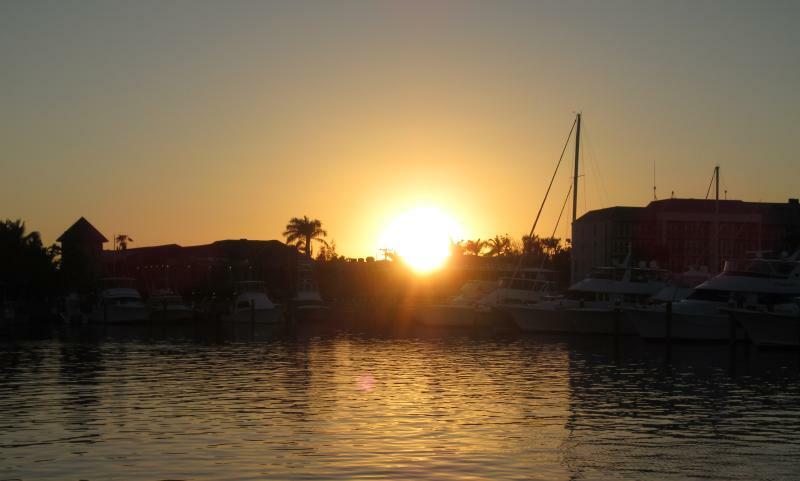 I knew where everything was and Key West doesn’t really feel like vacation, but amazing home away from home. 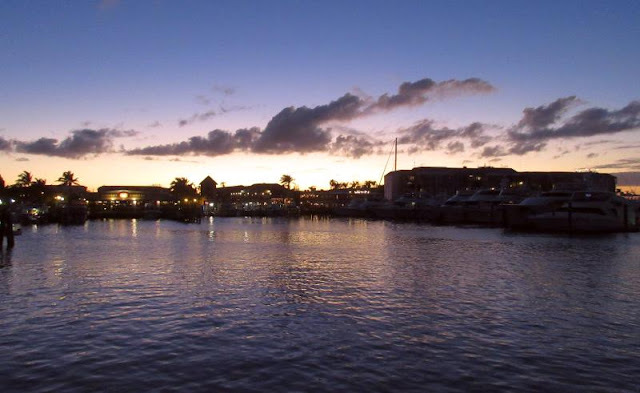 The bright tropical spirit and beautiful waters are the things that make you fall in love with this place. On the walk we went to CVS to get some essentials and we looked around in some stores. I got strawberry gelato and we walked back to the boat. I find it funny watching people paying so much to go on these crowded big boats. Afterwards, Natalie and I talked and hung out on deck watching the sunset. 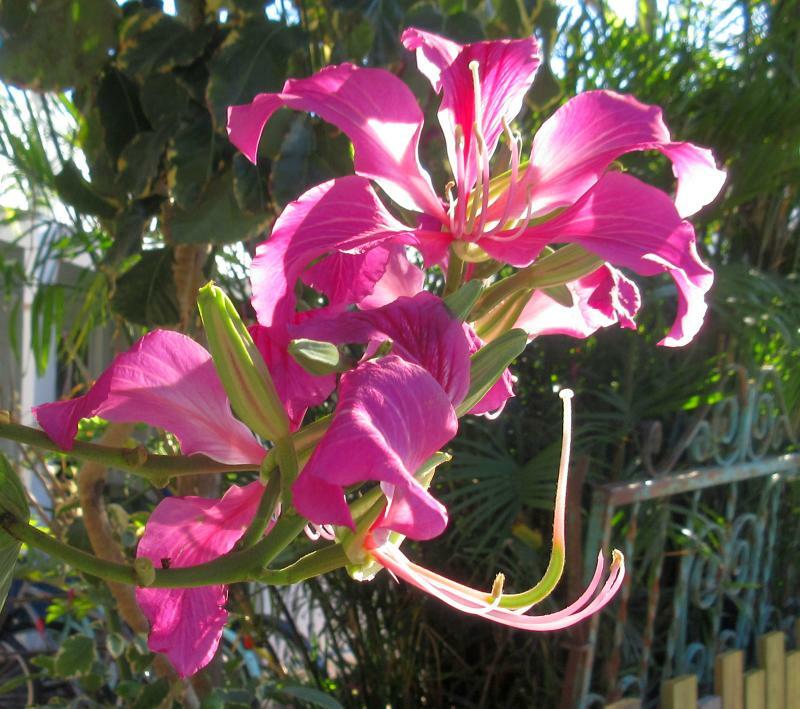 Now I am writing the Blog and can’t wait for another gorgeous day in Florida! Sarah is a Freshman in highschool and Natalie is in the 8th grade. They both will have blog duties during their week long stay on Fleetwing. After the long trip yesterday, complete with driving through a grass fire along US 1, it was time for a rest. 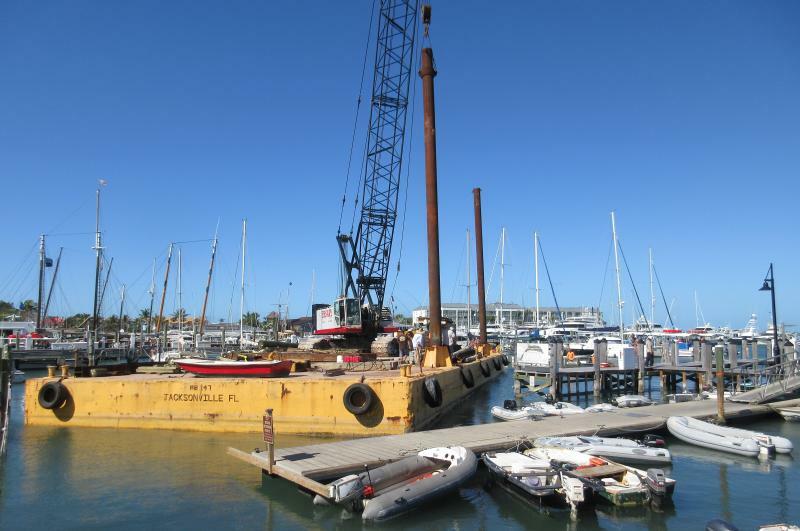 It worked out okay since today was also still a work day for the barge fixing damaged pilings. 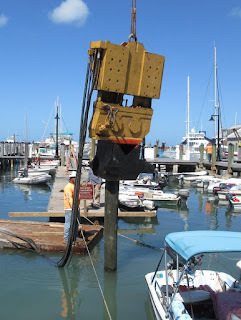 It's amazing how deep they drive the pilings. They completed the repair work for now and will be going over to Garrison Bight marina to do more extensive repairs. 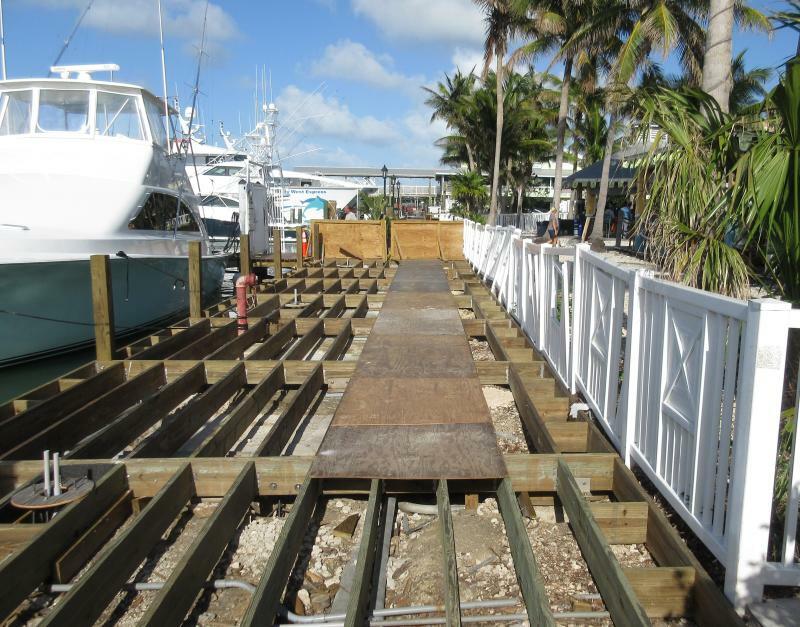 It suffered a lot more damage than Key West Bight. We plan a more active day on Friday with a trip to the supermarket for provisions and wine. Mostly, it will be just enjoying the warm, Key West weather with temps in the high 70's every day and no rain. No room, no room! Too tight a fit. 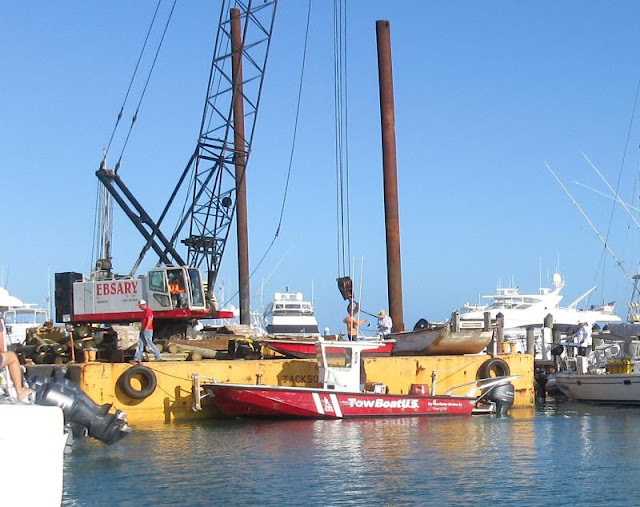 With the hurricane came damaged pilings. Nobody wanted to move but the damaged pilings still had to be replaced so the repair barge started moving this morning. They started down our fairway but quickly ran into trouble, they could not clear the first set of boats and so this huge barge with a crane on top, backed up. They had three pushers to help steer the barge. There was not much room but they backed out successfully. 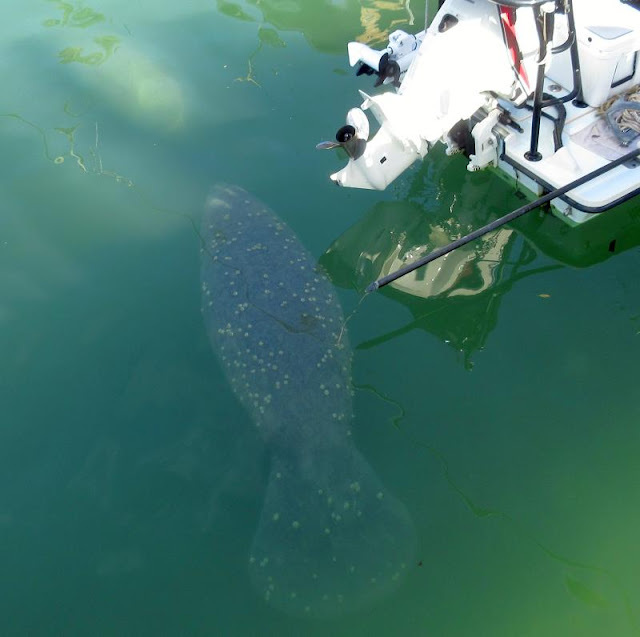 By the dinghy dock, still a tight fit. Having tried to come down the fairway with boats in place, the boats on the other side of the fairway now had to move (they were not happy). Now the barge once again came down the fairway but this time they had enough room to clear everyone and wound up by the dinghy dock where a couple of pilings had to be replaced which consumed the rest of the afternoon. We have a piling right next to us that has an orange ribbon on it so we are due for a replacement piling too. We were told we didn't have to move since they have a crane and can just pick it up without disturbing us (we hope). The barge with the carne is massive! A little 1 kt push against us would crush us! Our turn comes on Thursday so we'll see what develops. Meanwhile, we're waiting for our second crew to arrive and we just heard they are held up north of route 1 due to a forest fire. Route 1 is closed due to smoke so we don't know when they will arrive. This is as of 7:00 pm and they still have about a 3 hour trip at best. I think it's going to be a late night. 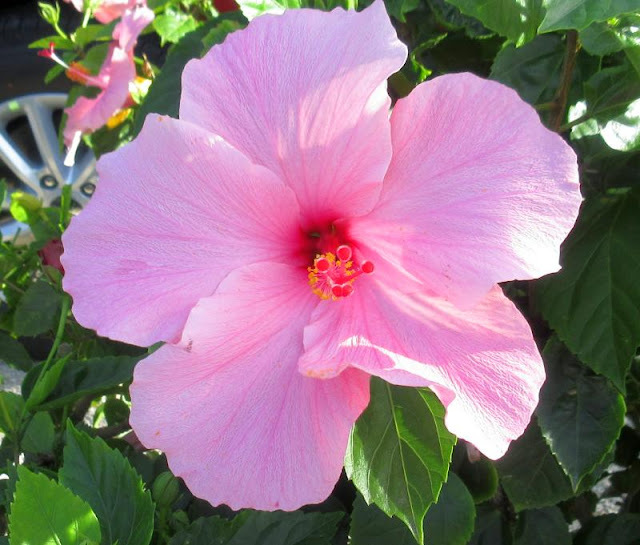 There are certain enjoyments in Key West that are not generally known, especially to tourists. 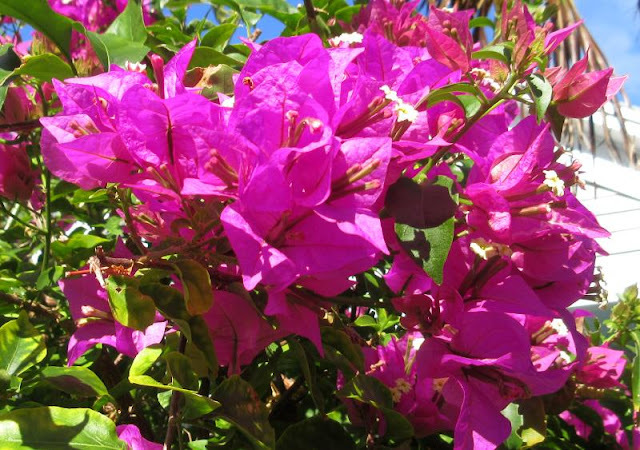 One example are the variety of walks that include excursions through small streets between the major thoroughfares. They could be called alleys I guess but they are lovely and usually decorated with flowers and tropical plants. In a later post I'll detail our favorite paths and discuss what to see along the way. Another example are certain musicians that not only play or sing well but also entertain the audience. 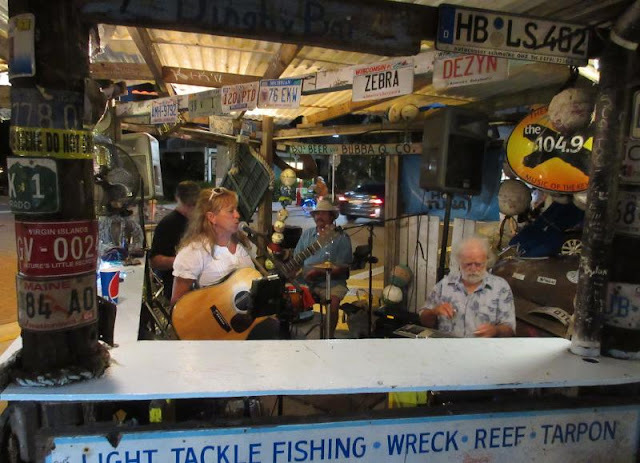 There are hundreds of musicians in Key West but only a few that fit into the category I described above. 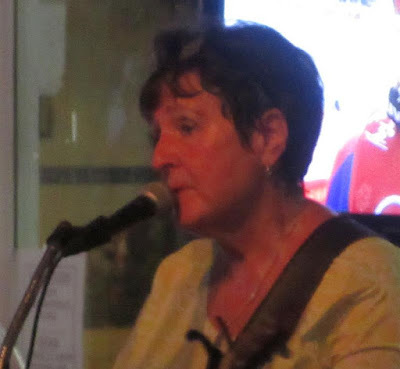 Tonight we witnessed Fiona perform her magic at a nearby restaurant, Key West Bite. She was born in Ireland and now tours all over the US but has made Key West her home for the past several years. Whenever she plays we make it a point to seek her out. She has her own following that will fill any restaurant she plays in. I'm sure that other people would have other lists of favorites but we are of a certain age and do not enjoy music so loud our insides vibrate. We like a melody and the ability to actually listen to the music without having to cover our ears. 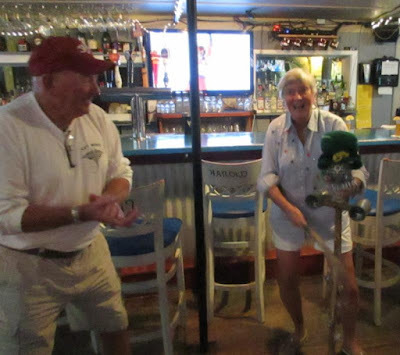 Meanwhile, our second crew will be on their way Wednesday to arrive at Key West late, probably after 8:00 pm. Sarah and Natalie along with their parents will spend a week with us in the sun here, lots of fun! The crew was sad to leave at 7:00 am this morning on their way to Ft Lauderdale for a motel so they can catch the early flight out Tuesday morning. 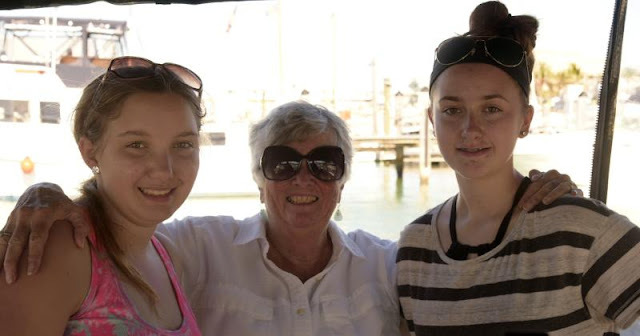 It was a grand time and nothing can compare to having a grandkid for six weeks on a boat. It's a great experience for the kid but also a great way for the grandparents to get to know their grandkids. We enjoyed every minute of it although Finn may not have enjoyed the homework so much. Carrie, Finn's mother, scanned in all the homework and tests that Finn completed and sent them to his school so he qualifies for returning to his class at the same level as the rest of the students. Wyland's mural on Williams street is intact! It suffered no apparent storm damage and is as bright as ever. 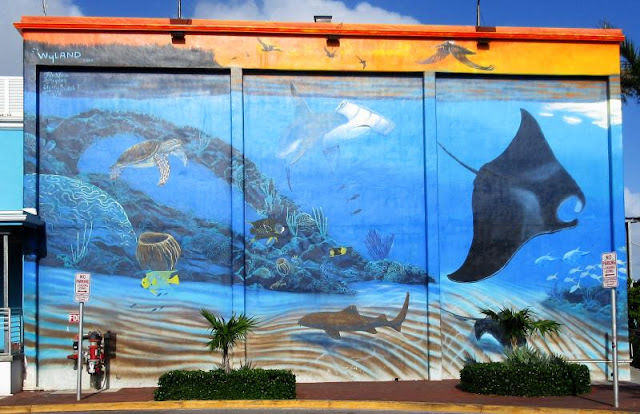 Wyland has about 100 murals of this type scattered all over the world. He will periodically refresh the paint if one starts to fade a bit. 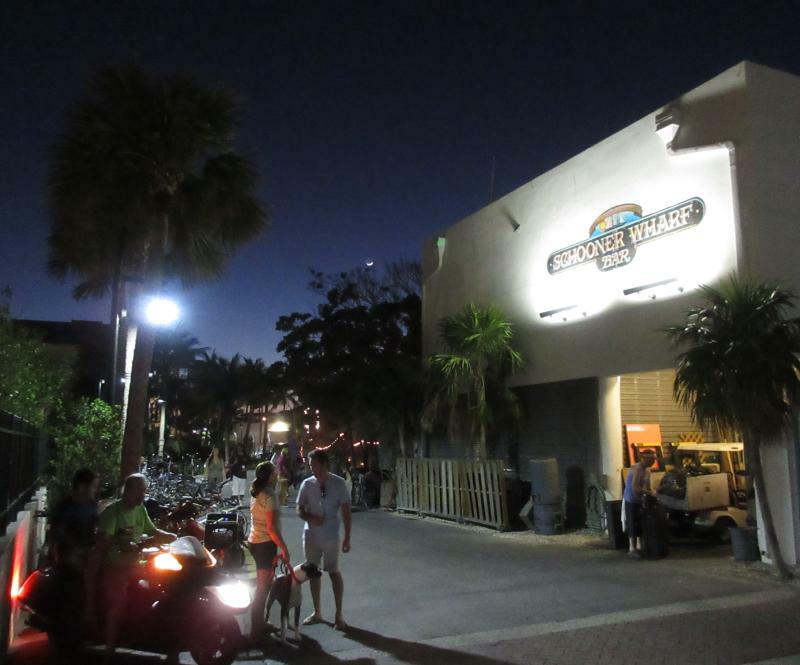 He has an art gallery in Key West that we like to visit when we're here. Here's one piling that didn't survive - to be replaced this week. 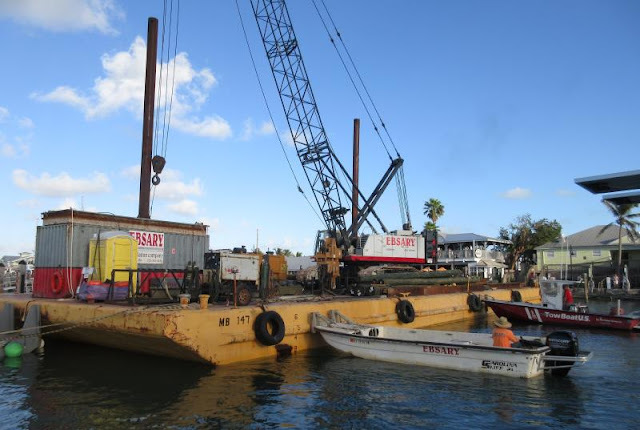 Key West Bight suffered very little damage but some of the pilings still have to be replaced. That's causing some consternation when the crane doing the replacing blocks the access to charter boats trying to make a living. We have a piling due to be replaced but we can stay in place for the procedure although we won't be able to leave our slip for a couple of days which is not a problem for us but is a problem for charter captains running excursions. 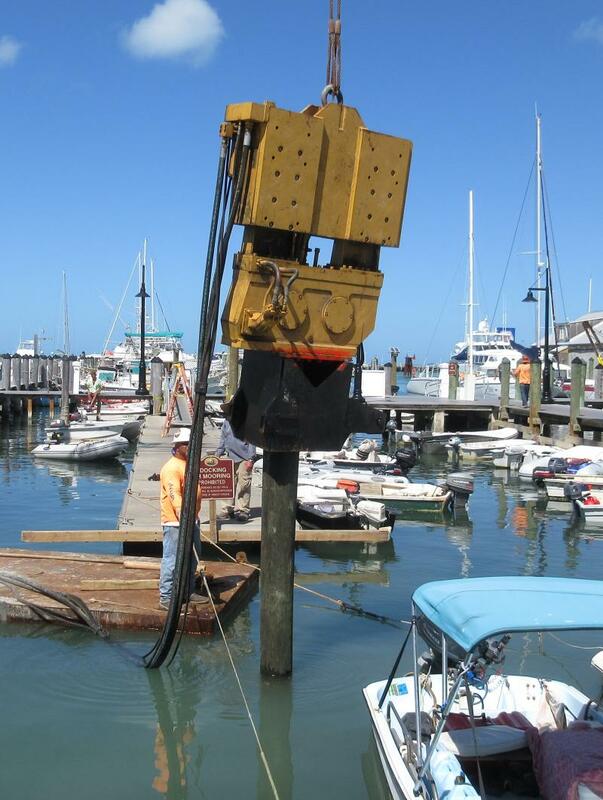 Nevertheless, a few pilings do have to be replaced but there will be some grumbling. Our next crew is due to arrive Wednesday night for a week's stay provided they recover from a stomach virus that has put them to bed for the last two days. Well I guess this is it. I always hate goodbyes but I guess it’s the only thing I can say to you. Today was a good last day. 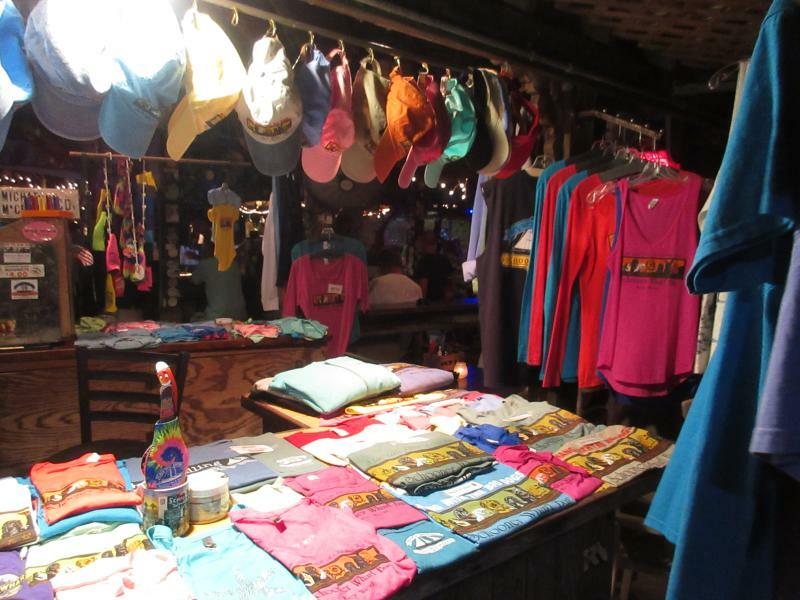 We went shopping around Duval Street. I got a leather bracelet with a skull on it. But I had to tie it to my wrist. Tonight’s dinner was amazing. I had shrimp with garlic sauce on top so it tasted like cheese shrimp. They combined the best things in the world. I also got a bag of candy at It’s Sugar. I am the only one I know that likes black liquorice. Tomorrow we’re leaving at 7:00 am. I am going to bed early. Well I guess this is goodbye so Good Bye and see you in the summer! 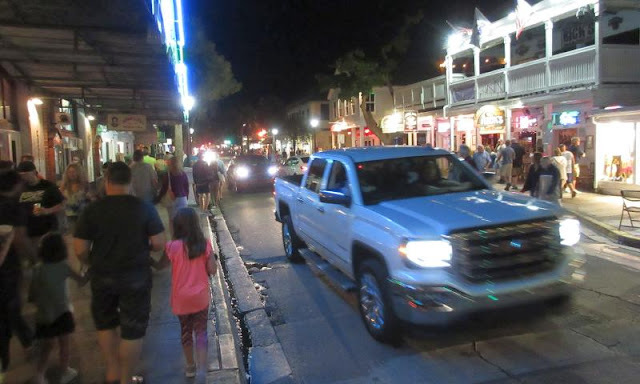 The gang went for one last stroll down Duval Street, window shopping and just enjoying the warm weather. 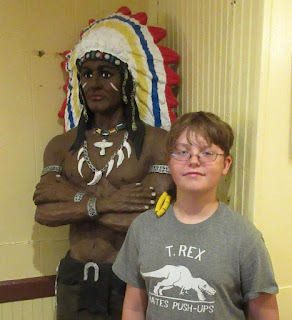 Rowan got his dad to take him on the Key West Conch Tour Train. It wasn't at the top of the list for Rowan's dad but it was number one with Rowan - he likes all things about trains. 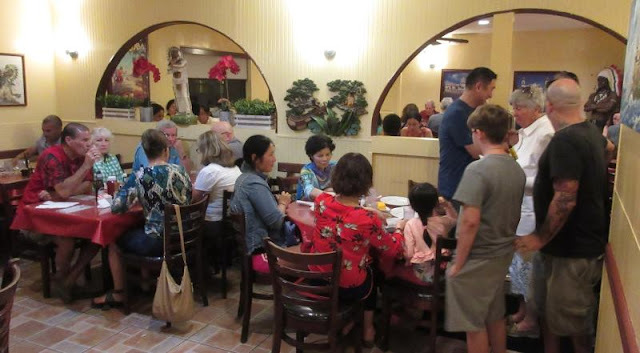 We were treated to a dinner out at El Siboney, a caribbean style restaurant that's a favorite of the locals. You won't see many tourists here except those that know of the place from friends. The food is better than good and there's plenty of it. They don't bother with reservations but there's plenty of room although when we left tonight the place was about 90% full and they have a lot of tables. Not a tourist in sight (except us). Our crew of the last week will be leaving Monday morning at 7:00 am to take a hotel room in Ft Lauderdale in preparation for a flight early the next day. But we will have an empty boat for only two days. Our next batch of escapees from the frozen north arrives Wednesday for a week's stay. Today was a fun day. We went to Bahia Honda. We went to the beach and snorkeled too. I saw a large parrotfish in the water and a few smaller fish and minnows. I tried to follow the minnows but I lost them as I tried to catch one of them. The sun has taken a great toll on us. We are all a bit edgy with each other so we have been trying to stay away from each other. Tonight’s menu is Caribbean jerk chicken. That’s all I did today. The kids wanted a day at the beach so they chose Bahia Honda and we chose Fleetwing. They had a grand time swimming and snorkeling and we had a grand time resting on the back of the boat! 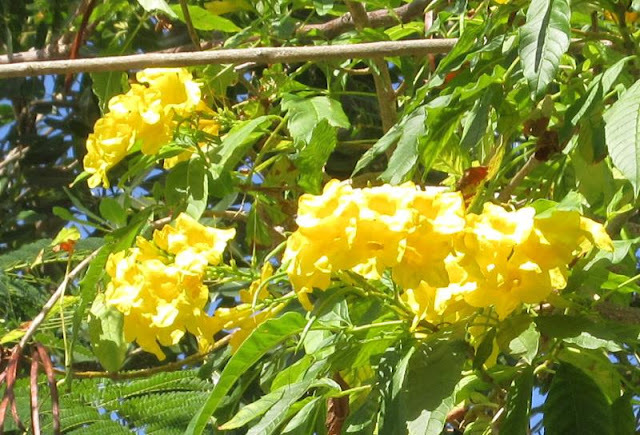 As you can see from the photos, the flowers are coming out now in droves due to the warm weather. We're in that period of time where we seek out the shady side of the street for our walks in the afternoon instead of the sunny side. We usually flip over to the shady side in March but it's been warmer than usual for this time of the year. With all the cool weather we've had on the trip down, we certainly don't mind the warmer than usual weather now! Sunday is donut day on Fleetwing but Ann has been baking her own donuts in the oven the last few weekends. 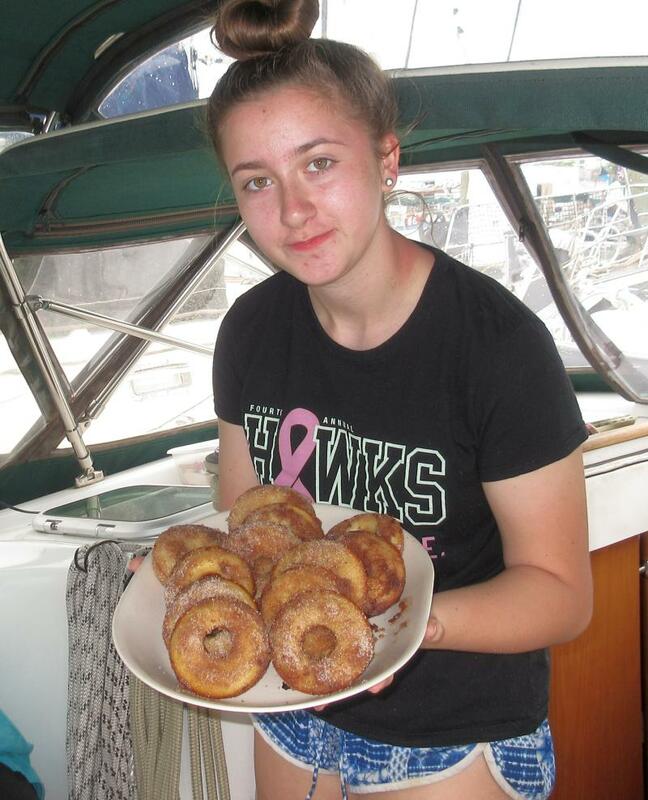 She uses a special pan that shapes the dough into a donut and then they are dipped into cinnamon at the end. They have become a hit on Fleetwing. I love the taste. again. They have to fly back on Tuesday so they will leave Key West for a hotel Monday night in Ft Lauderdale. So goes another week in the sun!